Many people still have the wrong impression that if a debtor dies, their debt dies with them. Not quite true. Debt does not necessarily vanish when the debtor dies. The short answer is every creditor will get paid, in full, even when the debtor dies, so as long as the deceased person has enough assets to satisfy all the debts and an action for collection is commenced within one year from the date of death, usually, depending on the state. When an estate is probated, the first job for the executor or personal representative is to do a complete inventory of the deceased person’s assets and liabilities. After satisfying all the liabilities from the remaining assets, the executor or personal representative will distribute the remaining assets to the beneficiaries or heirs. Debts are paid according to priority, with the secured debt being paid first. Secured debt, for example, is when the creditor has a lien or mortgage on the asset in question. The unsecured debt is usually paid last after funeral expenses, administration cost, and taxes are satisfied. If your debt is unsecured and ends up at the bottom of the list, chances are that your debt obligation may be uncollectable. What’s worse is that you cannot go after the executor, or the personal representative, or the heirs, unless they are personally liable for the debt. Sometimes the deceased person may have tried to put assets into a trust or other hard to find entities or they could have intentionally tried to conceal assets before they died. 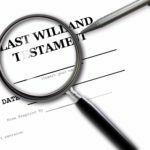 In addition, the executor or personal representative may not be aware of this and may not have properly satisfied their “due diligence” by identifying all the assets and liabilities by conducting an asset search through a professional asset search company. In either case, some assets of the deceased were not discovered and identified. Had the hidden or hard to locate assets been uncovered, there would have been sufficient assets to satisfy the debt owed to you. Therefore, it is highly recommended that unsecured creditors conduct an assets search on the deceased person to ensure that all of the assets are identified and sufficient to satisfy the debt owed to you. Likewise, it is equally important for secured creditors to conduct an asset search because their priority lien(s) may coincide with the attached asset and the value thereof at the time of collection. If the value of the asset turns out to be lower than the value of the debt, the deficiency is seen as an unsecured debt and will face the same risk of being an uncollectable debt. An asset search conducted by a professional asset search firm can also alert creditors in determining whether a creditor has died and when. The search will also satisfy the creditors own due diligence in locating all of the assets and liabilities of a decedent within the statute of limitations so that a decision can be made as to whether good money should be spent on further collection proceedings. The cost of an asset search on a deceased person is usually under $ 300 and at Asset Searches Plus, Inc., www.assetsearchesplus.com, for example, the cost for a nationwide asset search is only $ 185.00 for an individual asset search. The turnaround time is usually 1 to 3 days and your own due diligence will have been satisfied by conducting the search.